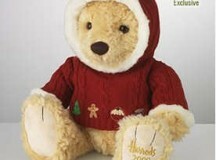 Since 1986 Harrods have been producing a teddy bear to celebrate Christmas bear. 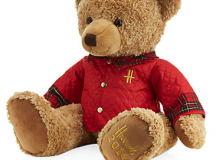 The first specially designed bear was ‘Snow Bear.’ We ran a feature of Harrods Christmas Bears a few years ago which has become one of our most popular articles. 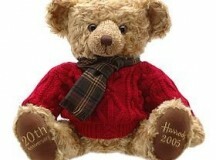 There are quite a few collectors out there and each year there is much excitement about the annual bear. 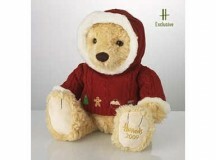 2009 sees the newest Harrod’s Christmas bear ‘Maxwell’ join the twenty-four strong hug of furry friends. Made with a super soft caramel coat he has warm chocolate brown eyes and is snugly wrapped up in a cherry red hooded jumper which has embroidered Christmassy items such as a festive tree, gingerbread man and Christmas pudding around the bottom. paw, he’s ready to make somebody’s Christmas even merrier.